Waterloo Leisure Services has openings for its Adult Basketball League that begins Jan. 9. League fee is $275 plus tax. Registration deadline is Jan. 2. Registration is open for Waterloo Leisure Services’ youth basketball leagues for boys in grades 1-4 and girls in grades 1-3. League fees are $33 for all levels except 3rd-4th boys, which is $37. Openings remain for men’s, women’s and co-ed Spring Adult Volleyball leagues in A, Upper B and B divisions at the Cedar Valley SportsPlex in Waterloo. League play runs for eight weeks beginning Jan. 7. Registration fee is $87 plus tax. For more information, call the Cedar Valley SportsPlex at (319) 291-0165 or go online at www.cvsportsplex.org. University of Northern Iowa 184-pounder Drew Foster has been named Big 12 Conference Wrestler of the Week. 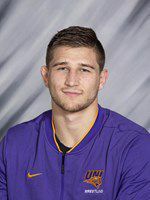 Foster, a senior from Burlington, won his weight class at the prestigious Midlands Championships over the weekend, helping UNI to a runner-up finish that was the best in program history. Foster put together a technical fall, a pin, two major decisions and a 3-2 win over Iowa’s Cash Wilcke for his title.